First Call Resolution (FCR) is arguably the most important metric for small and midsize contact centers to track. As the name suggests, a First Call Resolution is a call that gets resolved by the support rep on the first call. Despite the importance of tracking FCR, small and midsize contact centers are often at a disadvantage compared to the big budgets and resources that larger contact centers have. As a result, tracking accurate data can be difficult. Yet FCR is essential because FCR is an excellent proxy for so many other measures of success. Customer Experience – You normally see high FCR and high CSAT scores going hand-in-hand. According to a study done by Customer Relationship Metrics, CSAT will be 35-40% lower when a second call is made for the same issue. Agent Performance – Your reps are knowledgeable and trained well enough to resolve customer’s concerns on their first call. Low Hold Time – If a problem was resolved in one call it probably means the customer didn’t experience frequent or long wait times. Streamlined Process – FCR indicates that your entire process is relatively smooth and well thought out. Average Handle Time – A problem is likely to be resolved on the first call if the customer gets their answer quickly. 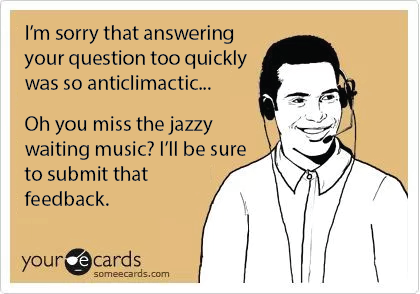 The longer it takes to answer a question, the less likely the customer is to stay on the line to resolve the issue. Longer than necessary call times can also create bottlenecks that result in other callers getting stuck in a queue for too long. Better Customer Effort Scores – Customer effort score is often a better measure of customer loyalty than CSAT. Let’s be honest, when calling into a company most consumers just want an easy, frictionless experience. Customers will ultimately resent you if they have to jump through too many hoops to finally get an answer. Less Agent Burnout – A first call resolution leads to less customer frustration directed towards reps and makes an inherently stressful job more enjoyable. No customer wants to complain to a call center, much less prolong the experience over multiple calls. If you’re missing the mark on First Call Resolutions, your customer experience is suffering. Almost as much as Kanye at the MTV awards (or you after reading that joke…). If that weren’t bad enough, a low FCR is also indicative of an inefficient call center that is not cost effective. A low FCR is like one punch in the face after the other. But a high FCR, is like the holy grail of happy and efficient contact centers. It’s the gift that keeps on giving. Efficiency – An efficient call center is cost effective. Costs are predictable and your contact center completes its core tasks and responsibilities with little waste. Customer Satisfaction – The hallmark of a great contact center is that they make it easy for customers. Customers who get what they need quickly (in one call) are happier. Employee Satisfaction – Unhappy employees do not provide very happy experiences to the customers they speak with. Employees who love their jobs treat customers better, stay at their jobs longer, and are better trained. FCR is such a powerful metric because it’s almost impossible to obtain without also accomplishing all three of the above. Let’s say your call center is not efficient. That means that customer satisfaction is going to drop because it is difficult for them to get the answer they need quickly. Angry or agitated customers typically leads to unhappy employees because keeping the customer happy is outside of their control. 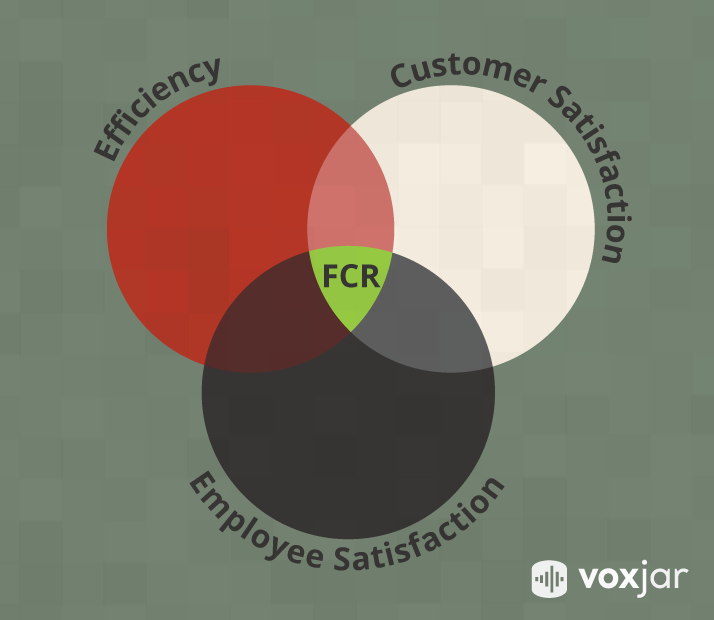 The core of both FCR and your call center are your employees. They are your single greatest cost and most valuable asset. Retaining excellent employees and giving your employees the support and feedback they need to be excellent is where your big gains come from. Employees need good feedback. They need to know where they can improve as much as they need praise for what they are doing well. And this feedback needs to be timely. Most employees get feedback once a recording of their call is listened to. This can be days or even weeks later and by then the call is no longer fresh in their minds. Managers who measure and track quality performance give much better and much more timely feedback to their employees. Employees who have consistent, timely, constructive feedback have more direction and feel more engaged. They improve, feel happier, and stay longer. What you end up with are employees who get better faster, with less turnover. So you not only need to track basic analytics (like calls made, etc) but you need to be able to know when a call goes poorly, you need to give constructive feedback on it, and it needs to be timely. The problem is that getting a solid measurement of employee performance is very time intensive and manual without speech analytics software. 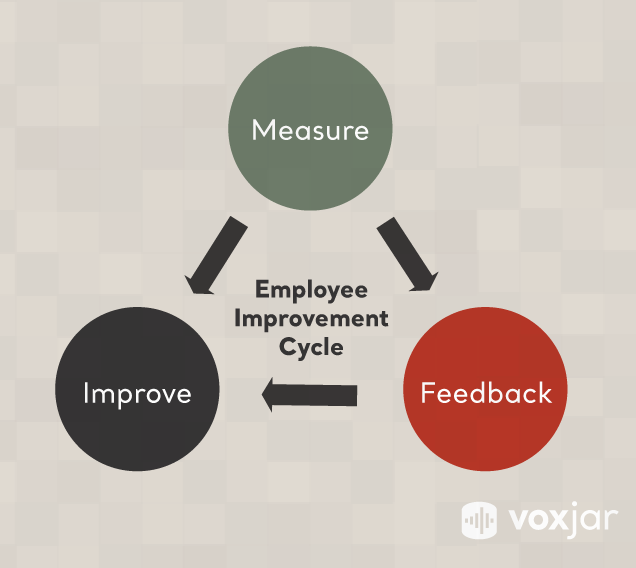 The feedback/improvement cycle breaks when you can only listen to a small fraction of your contact center’s recorded calls. Most small and midsize contact centers can only review ~5% of calls because each call must be listened to manually. Measuring a tiny fraction of customer and agent interactions means that you are in the dark for most of what is happening. Reps don’t get the complete feedback they need to improve and if you ever do find a serious issue, it’s almost certain to be weeks or even months late. Do you report to your clients that you’ve only just now caught a long-standing problem or do you try to tackle it on your own now and hope to high heaven that it doesn’t come back to bite you? Only knowing what happens in 5% or less of calls also creates an easy excuse for reps. How do you know whether the issue you caught only happened “that one time”. Can you really say without a shadow of a doubt that the agent is wrong here? Most can’t. And your reps know it. Operating in this way doesn’t just risk the quality of customer engagements but also drains the accountability and trust out of your relationship with front-line agents. When a rep knows that 100% of what they say on 100% of calls is logged, it creates accountability. This is especially true when the rep also gets prompt feedback on issues. The window for maximum improvement is open widest while the memory of the call is still fresh on the rep’s mind. All of this helps to create a virtuous cycle of accountability, feedback, and improvement that makes your reps happier and more productive. So how do you listen to 100% of calls and give feedback on all of it? One solution for this is speech analytics software. Speech analytics software can listen to 100% of calls versus 5% or less that humans can do. The problem is that most speech analytics software platforms are overly complex and were made for enterprise-sized companies. That’s why we made Voxjar. We believe that Voxjar can help you improve FCR in your small or midsize contact center more than any other tool. 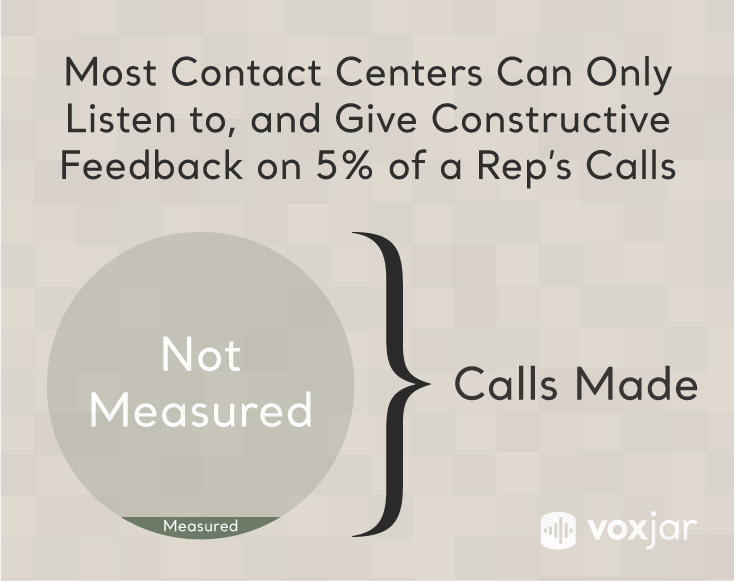 Voxjar automatically listens to 100% of your contact center’s calls. 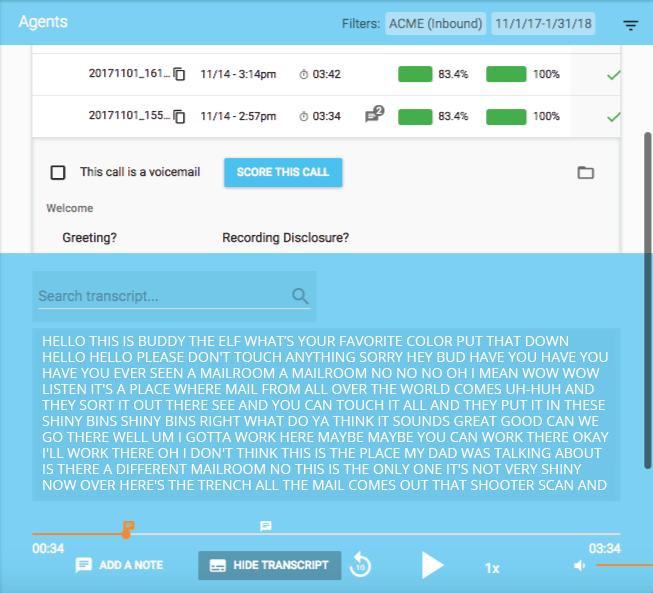 Transcripts are created for every call that can be searched or automatically analyzed for keywords and phrases. Voxjar can surface problem phone calls. For example it can warn you when reps are not adhering to required greeting or disclosures. Voxjar can measure how many calls resulted in the collection of customer information, if anyone swore on the call, etc. If your calls are supposed to contain certain language or are supposed to follow a particular pattern, Voxjar can help you measure them and automatically bring specific phone calls with issues to your attention. Once Voxjar flags a specific call, quality assurance team members can listen to it and easily provide targeted feedback. 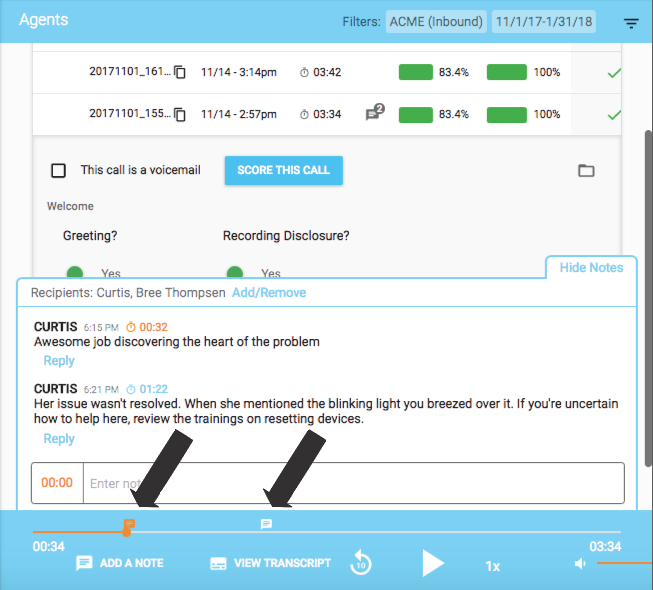 Notes are attached to the exact time in the call recording to which they apply, making it easy for reps to listen to the sections of their call that have feedback. The rep will automatically receive an email notifying them that their supervisor attached notes to their calls so that they can review the notes and listen to the relevant section of the call. Calls that were great can also be added to a library of best practices. All of your reps can use that library to learn from each other and improve. 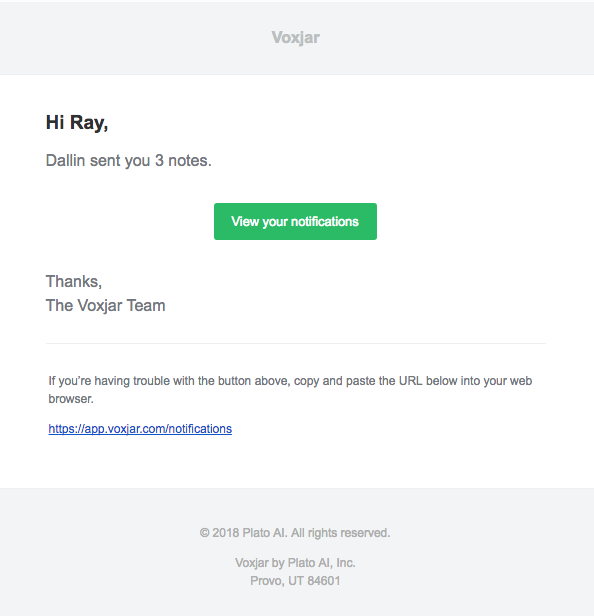 Voxjar can be customized to monitor calls and report on the specific things you want to see in your calls (or the things you don’t want to see). Click below to setup a live demo. We’d be happy to customize and tailor it with a set of sample calls from your company so you can see what it finds for you.